From the award-winning audio drama team that brought you Radio Theatre's "Amazing Grace" and The Chronicles of Narnia. In his enduringly popular masterpiece "The Screwtape Letters, " C. S. Lewis re-imagines Hell as a gruesome bureaucracy. With spiritual insight and wry wit, Lewis suggests that demons, laboring in a vast enterprise, have horribly recognizable human attribut From the award-winning audio drama team that brought you Radio Theatre's "Amazing Grace" and The Chronicles of Narnia. In his enduringly popular masterpiece "The Screwtape Letters, " C. S. Lewis re-imagines Hell as a gruesome bureaucracy. With spiritual insight and wry wit, Lewis suggests that demons, laboring in a vast enterprise, have horribly recognizable human attributes: competition, greed, and totalitarian punishment. Avoiding their own painful torture as well as a desire to dominate are what drive demons to torment their "patients." 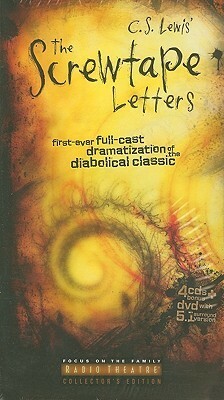 The style and unique dark humor of "The Screwtape Letters "are retained in this full-cast dramatization, as is the original setting of London during World War II. The story is carried by the senior demon Screwtape played magnificently by award-winning actor Andy Serkis ("Gollum" in Lord of the Rings) as he shares correspondence to his apprentice demon Wormwood. All 31 letters lead into dramatic scenes, set in either Hell or the real world with humans--aka "the patient," as the demons say--along with his circle of friends and family. This Radio Theatre release also stars Geoffrey Palmer ("Tomorrow Never Dies"), Laura Michelle Kelly ("Sweeney Todd"), Eileen Page ("The Secret Garden"), and other world-class actors. Includes 10 new songs inspired by the classic book, four behind-the-scenes video documentary featurettes, and a 5.1 surround sound mix. Four CDs, approx. 4 hours total.